Container of certificates of a key. The container is used to search/enumerate certificates of a key. The container can be created only by detail::KeyImpl. Definition at line 47 of file certificate-container.hpp. Definition at line 86 of file certificate-container.hpp. 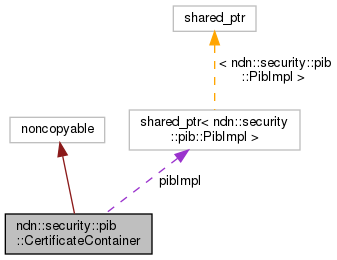 Definition at line 92 of file certificate-container.cpp. Definition at line 98 of file certificate-container.cpp. Definition at line 104 of file certificate-container.cpp. Definition at line 110 of file certificate-container.cpp. Add certificate into the container. Definition at line 116 of file certificate-container.cpp. References ndn::security::v2::Certificate::getKeyName(), ndn::Data::getName(), and ndn::Name::toUri(). Remove a certificate with certName from the container. Definition at line 129 of file certificate-container.cpp. References ndn::security::v2::extractKeyNameFromCertName(), ndn::security::v2::Certificate::isValidName(), and ndn::Name::toUri(). Get a certificate with certName from the container. Definition at line 143 of file certificate-container.cpp. Referenced by ndn::security::pib::detail::KeyImpl::getCertificate(), and ndn::security::pib::detail::KeyImpl::setDefaultCertificate(). Check if the container is consistent with the backend storage. this method is heavyweight and should be used in debugging mode only. Definition at line 161 of file certificate-container.cpp. Referenced by ndn::security::pib::detail::KeyImpl::addCertificate(), ndn::security::pib::detail::KeyImpl::getCertificate(), ndn::security::pib::detail::KeyImpl::getCertificates(), ndn::security::pib::detail::KeyImpl::getDefaultCertificate(), ndn::security::pib::detail::KeyImpl::removeCertificate(), and ndn::security::pib::detail::KeyImpl::setDefaultCertificate(). Definition at line 138 of file certificate-container.hpp. Definition at line 144 of file certificate-container.hpp. Definition at line 157 of file certificate-container.hpp. Definition at line 135 of file certificate-container.hpp.